Don’t look now, but the 90’s black metal nostalgia kick is in full swing. After hearing the excellent new WINDSWEPT album recently, here comes the freezing fire known as VIMUR to try their hand at the classic misanthropic style. What’s more, these guys hail from the frostbitten plains of…Atlanta, Georgia?! They make a good first impression simply with the excellent cover art here. That always helps put one in the mood for epic darkness, and epic darkness is the best description of the VIMUR sound. The songs are extremely fast, cold and vicious but still with very notable melody and the occasional dash of grandeur. 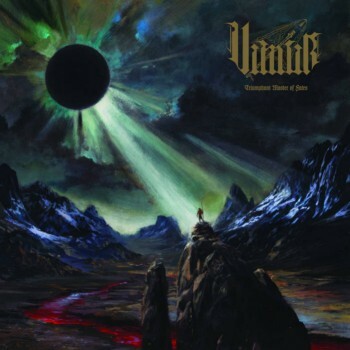 I hear so much of this stuff, it’s hard to truly lavish praise on it, but VIMUR know what they are doing, and as the album rumbles on, it actually gains force and impact. ‘Adversarial Impetus Ignition’ has an almost deliriously upbeat sound to it that is kind of different, but the album comes into its own with ‘Nuclear Desecration’, which lays waste to your brain with a blackened death metal feel. ‘Our Dearest Hopes Lie Buried Here’ is the opposite side of the coin…a slow, doomy and majestic crawler much in the vein of the slower BATHORY Viking odes. The band unleash a 10-minute opus to conclude the album, ‘Supreme Presumption Of The Lightless Emptiness’, showing they are as long-winded in song-naming as they are in performing. This one covers a lot of ground but for the most part is fast to the point of insanity. Very decent black metal album from VIMUR here that should be on the short list of anybody trying to relive the glory days of the movement.